Starbucks stores (some licensed stores or ‘we proudly brew’ locations might not participate in Starbucks Rewards). The Starbucks Reserve Roastery in Seattle. How many Star Rewards do I have? I take 125 and divide it into the number of stars that it shows that I have. So, at the time that I took this screen cap, I had 465 stars. 465 divided by 125 is 3.72. If I have 465 stars, then I have 3 rewards that I can use. The fractional parts simply stay unused until you earn enough stars for another whole reward. Right now, I have 542 stars. So, 542 divided by 125 is 4.336. That means I can used 4 rewards. When do my Star Rewards expire? This is a bit tricky. In theory, it is possible that your rewards last as long as six months. When your stars expire, the reward expires with it. So if I earned 100 stars April 1, 2016, and 25 stars on May 1, 2016, I would have 125 stars and one reward. 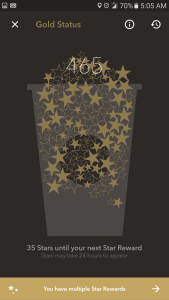 The 100 stars earned on April 1, 2016, would expire on October 1, 2016, since that is six months after earning them. That means, I would need to use that “reward” before October 1, 2016. In other words, you would need redeem your 125 stars for a reward before the earliest portion of the stars earned expire. And stars expire 6 months after earning them. What about my birthday reward? Has that changed? Your birthday reward is unchanged. 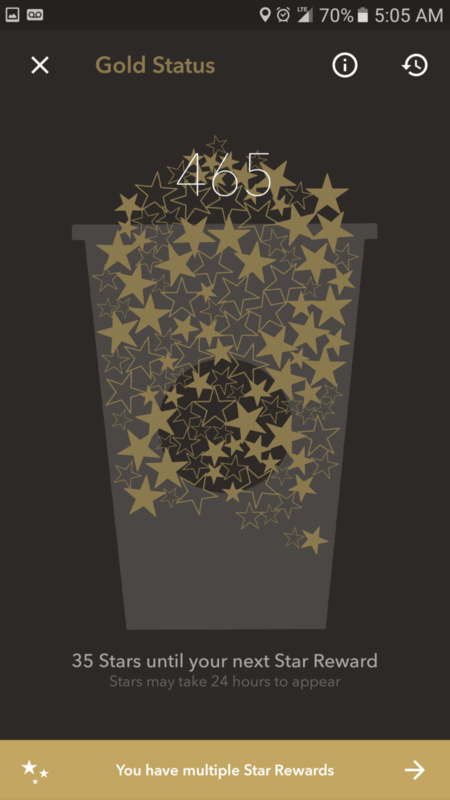 Your reward loads on your Starbucks.com profile, usually 2 days before your birthday. The reward has 4 day window of time to use: 2 days before your birthday, the day of your birthday, and one day after your birthday. It is possible that when you click on Star Expiration, you might see a bunch of zeros. Since the new program is not anywhere close to 6 months old, nobody should have stars that are about to expire. You’ll notice that my “Transaction” section is empty. I don’t know why but it’s not giving me recent transactions. As I was writing this article, I called Starbucks Customer Service. I spoke with Christina, literally like 15 minutes ago (Saturday, May, 14, 2016 at roughly 10:40 AM PST). I had thought that maybe she could tell me if there was a known bug with the Android version of the app. I called from my landline and uninstalled and reinstalled the app as we talked on the phone. Still nothing. Christina didn’t know why I have no transactions. She gave me a case identification number and told me that she’d escalate the call. And that was it. I could call back in a few days to see what happened. I recall the last time that I called Customer Service and was promised a call back, nothing happened. That was a long time ago though. I probably call Customer Service no more than once per year. At the end of the phone call, mostly just out of curiosity, I asked, “Have you ever heard of the website StarbucksMelody?” She said, “No.” I vaguely remember asking the same question last time, and getting the same response. 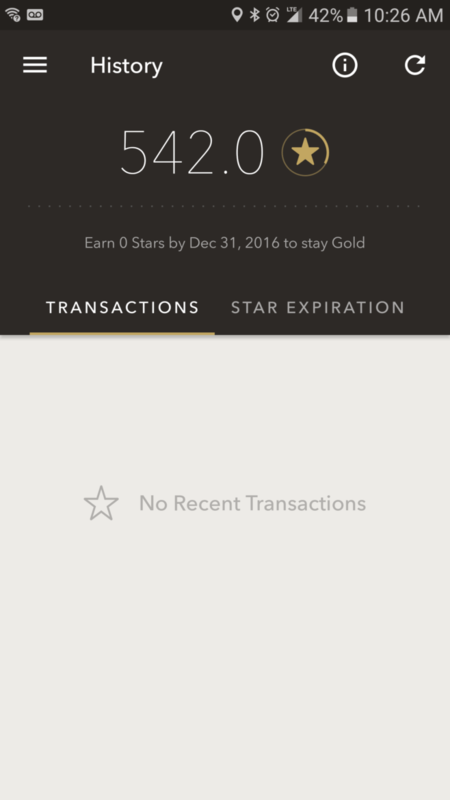 In any event, hopefully you have an app where both your Transaction section and Star Expiration sections work. Mine do not. 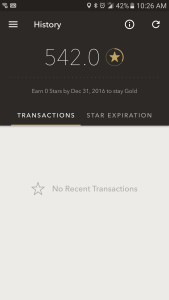 We won’t really have a good sense of how the 6 month star expiration affects customers ability to redeem rewards until about mid September to October, when this new Starbucks Rewards program is about six months old. Theoretically, let’s say that you’re at Gold Status and you earned 100 stars on May 1, 2016. Let’s imagine you did not return to Starbucks until October 15, 2016, and you earned 25 stars. You would have enough stars to redeem for a reward. But the first 100 stars will expire on November 1, 2016. Under this scenario, you’ve got 15 days to redeem your stars towards a reward. As I mentioned, it will be interesting to see how this plays out as we get further into the year. Don’t forget to make the most of your rewards! You can customize a drink, get a bistro box, a salad … lots of wonderful things! Starbucks launches new collectible destination cards. I’m glad to see that the ‘six months’ timeline is actually 6 months after the end of the month you earned the points (so 6 to just under 7 months). The website stopped showing expirations past the next four months, so most people shouldn’t dwell on losing points for a long while, and unless you’re planning on saving points for a long time so you can use them all in a flurry of activity, you should be safe (not to mention we haven’t seen the built-in warning alerts planned for the app). My biggest problem is a holdover from the old MSR. More than half of the time, I do not get the bonus stars awarded to my account when I complete an offer. Star Dash, bonus for At Home Coffee, buy these 3 items in the next week, none of them matter. They don’t give me my stars. I just completed a message to Customer Service letting me know I’m owed 160 stars from two different promotions. I truly hope that they aren’t letting this slide knowing they have so many overlapping offers, that customers might not realize when they haven’t been awarded the stars they deserve. Great article. My absolute favorite part of the new rewards program is having that 6 month redemption window now for rewards. The only drawback is learning to do math. I am learning how to solve math divisible by 125. I have problems with the “recent transactions” section as well — it only works very sporadically. One new thing I’ve noticed: I’m no longer being offered the option to tip through the app, something I did all the time. The tip jar also seems to have vanished at my regular Starbucks. Has Starbucks done away with tipping? I am hopeful that if recent transactions comes back, that tipping will come back too. I missed being able to tip through the app too. BTW, tipping was back on my app this morning, and recent transactions seems to be functioning. Things are looking up! One of the big “hurrays” from some of you when the new program started was that you wouldn’t have the lineup slowed down by people wanting their cards swiped once per item ordered so that three things get them three stars. Curiously, the current “Star Dash” promo isn’t based on DAYS visited as it used to be, but just VISITS. So we’re back to people scanning their cards multiple times (each transaction counts as a “visit”) so that they can reach those 15 visits for 150 stars faster. Can you use your reward on the day the points expire? For example if they are to expire September 1, can I use them on that day or do I have to use them by August 31? There was a big stink when Air Miles (one of the biggest loyalty programs up here, probably just behind Air Canada Aeroplan) threatened to expire all miles earned more than 5 years ago. This new law was a result of that outrage.